Gelatin, Maltodextrin, Magnesium Stearate, Silicon Dioxide. As a dietary supplement, for maximum results take one capsule in the morning on empty stomach. DO NOT EXCEED two capsules a day of INSANITY™, or take at all within five hours of bedtime. As individuals vary, so may the results of this product. Tenacity is a scientifically formulated thermogenic designed for athletes who are looking for clean sustained tenacious energy without crashing after a few hours. 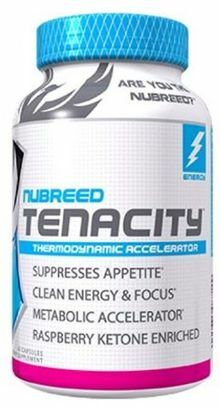 Tenacity with give you the clear focus and energy to keep you motivated to get you thru the day or training session.